1. 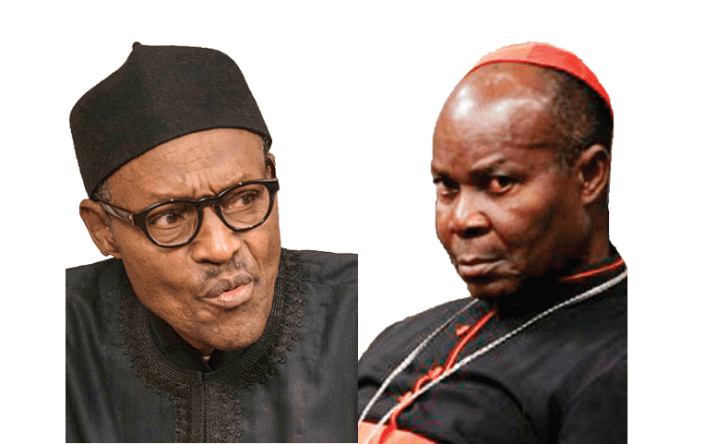 Okogie accused the president of waging a shoddy corruption war and acting disdainfully towards the judicial authorities while millions of Nigerians were left to face unimaginable social problems. 2. Okogie also cited a snail paced and disordered methodology in governance as one of his reasons. 3. He said a lost today found tomorrow 2016 budget debacle, showed incompetence. 4. He also pointed out the rudderless and confused Central Bank with an unclear monetary policy strategy as one of his reasons. 5. He noted that a lot of Nigerians are beginning to feel that Buhari is fast transforming this nation into a police state where Mr. President, the EFCC and DSS rule the day. 6. He also frowned at the President’s refusal to heed court pronouncements regarding the bail granted to the Director of Radio Biafra, Nnamdi Kanu and former National Security Adviser, Col. Sambo Dasuki. 7. He said Governors, who arm-twisted Okonjo Iweala into signing out our reserves held by Central Bank, are today ministers in the APC government and we are still talking about change and corruption when old things refuse to pass away. 8. Existing industries are almost dead and call for urgent revitalization. 9. The budget ought to aid solutions to the mass unemployment, Rural-Urban migration, skewedness in the distribution of income, abject rural poverty and industrialization of rural economy. 10 .He said Buhari preferred the use of counter trade and inward looking policies like cutting down cost and flamboyant exotic life styles before his emergence but he is not so sure we have the same Buhari again. His Holiness is a Nigerian and as such has the right to comment on matters concerning Nigeria. He has made his points and he has spoken the mind of million Nigerians. He who has ear , let him hear. Nice list of points by his holiness…you can not tackle corruption if you can not allow the rule of law to reign…We urge Mr president to respect court decisions…NB:Mr Olawale his holiness can not pray for nigeria without saying the truth first…..First thing First! The Cardinal has lost touch with realities. I hate to comment when ignorance and blind loyalty is displayed and not constructive argument and sound knowledge. People Mr Paul who have nothing constructive to say should close their mouths and nt dare to talk so that wisdom, intelligence and good counsel can enlighten the world. The cardinal is on point. Our government should fight corruption generally and not picking d opposition party. They should bring out policy dat will improve our economy and d ones dat will destroy economy, companies and increases unemployment. Our government should bring out policy dat will improve our economy and not d ones dat will destroy our economy, industries, causing more hardship to Nigerians, inreasing unemployment. I totally disagree with the Archbishop. Buhari deserves commendation for confronting the hydra-headed monster called corruption that has afflicted all areas of our nation, the church inclusive. That is what Nigerians elected him to do. Launching a global war against corruption is the wisest thing for Buhari’s government to do. The nation will reap bountifully from the effect of this war in due season and will be grateful to Buhari for it. Nigerians are solidly supporting Buhari on this score, and the Bishop, and an isolated few who have reaped from proceeds of corruption are dissenting. Nigeria can live with that. For now, full steam ahead against corruption and indiscipline!! !